She now lives in a lovely family. It took her time to relax with the two men when she came to them from the RSPCA a year ago, but now she’s soft, funny and loving. Tala is a three-year-old German Shepherd mix. They think it might be Husky or Malamute. 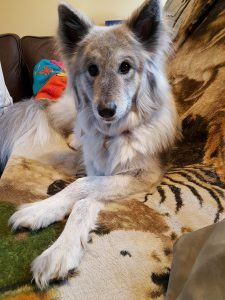 She looks very much like a Tamaskan to me (or Tamaskan Wolf Dog – a mix of breeds including German Shepherd, Husky and Malamute). The main aim of my visit is ‘for walks to be enjoyable both for Tala and her humans’. They have to walk her on lead in the places they currently take her. When she sees a dog she may react with hackles rising or she may drop down in stalking mode. She hangs back and hides from people. The shy dog has never shown any aggression. Tala is so stunning that people even stop their cars to ask about her. They want to touch her. Her harness has a label saying ‘NERVOUS’ which I think isn’t enough. It could even attract sympathetic dog lovers to get nearer and ‘reassure’ her. She needs something more obvious like the Yellow Dog Company yellow vest with ‘I NEED SPACE’. When I arrived I had arranged for her to be out of the room until I had sat down. The lady had ‘laced the environment’ around me on the sitting room floor with little bits of food. The family had strict instructions to leave her alone to make her own decisions. She walked over to me, stepping over the food (I had angled myself away from her, not looking at her). She sniffed me. I smell interesting – of my own four dogs. I slowly lifted my little pot, carefully peeled off the lid and got out a treat which she ate from my hand. The shy dog had accepted me. She then went and ate up the food from the floor. This method should particularly help her over being scared of men who come to their house – it’s quite a busy household which is a bonus. It’s not uncommon for a dog to be more scared of men than of women. So long as they follow instructions all should go well. She doesn’t like hats, so men should remove them. They can work on her fear of hats later. For ‘walks to be enjoyable’ involves work at home. Increased confidence and attention doesn’t just switch on the moment they close the front door behind them. How they are with her outside is a continuation of how she is at home. This means building up her confidence in general. It involves Tala thinking for herself without too many instructions. They will work on getting and keeping her attention – focusing on them when necessary, along with coming when called. If the dog won’t come straight away when called from across the room, it’s not going to happen out on a walk. For Tala to focus on themselves, they need to motivate her. This involves gaining control over the things she finds most important – food and her tennis ball. The family will no longer leave her food down and permanently available. They will hold back the tennis ball she loves, saving it for walks. There are other, better and more enriching activities they can do with her instead. Now, on a walk, a consciously relaxed owner will increase distance from any approaching person or dog at the very first hint of tension from Tala. They then will make good things happen. If the appearance of a dog now immediately triggers a sprinkling of chicken from an upbeat person holding her lead, how might that make her feel about dogs? If an approaching man triggers the throwing of her tennis ball to the shy dog, will she not begin to feel less scared of men? Next ArticleFeels Unsafe on Walks. Has he been Punished?